It's not a bad version of the unplugged sound, and with just a slight dip of the mid control you get a pretty good basic electro sound. Good build quality, a solid working instrument. 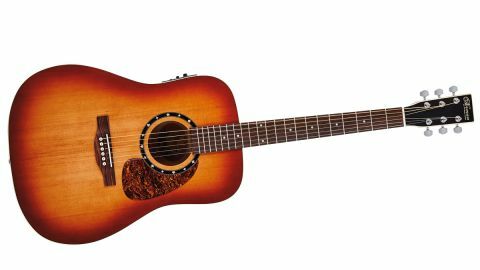 The entry-level Norman Protege range features nine dreadnoughts, including two cutaways and one 12-string, and the whole range is electrified - sporting Fishman's trusty Presys under-saddle/ preamp system. Our B18 is very cleanly built with the unusual pairing of solid cedar for the top and laminated wild cherry for the back and sides. The soundhole is a little unusual, but certainly lives up to the 'Canada's guitar' monicker with its stars and maple leaf motif. Your milage may vary, but we think it looks a little mismatched when paired with a coppery semi-gloss Sunburst (on the top only) and the tortoiseshell pickguard. We have no reservations about the hardware, however - the enclosed tuners are solid, and the nut and saddle are Tusq - the latter fully compensated to ensure accurate intonation. The neck is a comfortable mainstream C shape, fretting is tidy and there's very little to complain about here. Acoustically, despite the cedar top (from which we'd expect warmth and compression compared to spruce), we have quite a pushy, slightly hard- edged dread' tone, lacking a little bass compared to our reference Martin. That said, it sounds more than credible strummed, and with Fender-like 54.5mm spacing at the bridge there's enough air for your right-hand. Plugged in, there's an almost generic quality to the tone, but in a good way. The onboard EQs are certainly well centred and broad, and overall, this a well-sorted electro dread'.